An excerpt from Nau’s Histoire des caciques d’Haïti. Nau was a prominent Haitian intellectual and politician back in the time when Jean-Pierre Boyer was president in Haiti. The [Spanish] fleet was at the entrance of the bay of Acul which was calm until a surprise during the night of December 25th. The Admiral [of the Santa Maria] had left the deck to get some rest. Since all the other sailors were asleep, the helm was left to a novice. The water was strewn with reefs and sand banks; and, at a distance of two miles from shore one heard a roar from below. Suddenly, the novice, feeling the rudder stuck, let out a cry. The currents forced the ship onto a bank. The crew was up in an instant, but fled rather than try to avert the danger and did not execute the commands of the Admiral. Soon the ship leaned to one side and broke open. The water rushed in. It had to be abandoned. It submerged. How could [Columbus] bring back the shipwrecked sailors? The Europeans, moreover, who since the event had been left ashore, preferred to stay. They were soon so softened that nothing could lure them from the charms and indolence of indian life. The plan of Columbus, approved by [the friendly leader of the nearby village] Guacanagaric, to construct a fort for the resident Spaniards, resolved the difficult situation. The materials were abundant for this construction. They used the debris and equipment from the shipwreck. Work carried on; and a fort with a high tower were soon built. The Admiral give it the name Navidad to commemorate the day of their arrival. [Columbus] put 39 men under the command of several trusted officers…. He strongly urged them to obey their leaders and never forget to show respect and deference to the Caciques and to other indian chiefs. Columbus had no sooner left than his advice was forgotten. 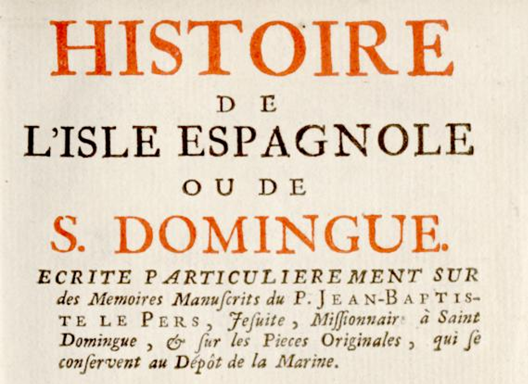 The Spaniards of Navidad abandoned themselves to the most criminal of excesses. Disobedience and indiscipline entered the ranks. Caonabo, the proud Cacique of Maguana who criticized Guacanagaric for allowing [the mines of] le Cibao to satisfy the greed of the Spaniards, began to organize a league Caonabo, the proud Cacique of Maguana who criticized Guacanagaric for allowing [the mines of] le Cibao to satisfy the greed of the Spaniards, began to organize a league against them, and swore at the same time to destroy their allies. He brought forth a large band of indians and went to Navidad. Nothing transpired during his long march through the mountains and forests. At night, he invaded the village of Guacanagaric and the fort, where he entered and massacred 11 Spaniards lost in a deep sleep. The others died in the flames that consumed the houses near the fort, whose ramparts and tower also reduced to ashes. The disaster of Navidad signaled the coming struggle between the conquerors and the aborigines. It afflicted Columbus profoundly. 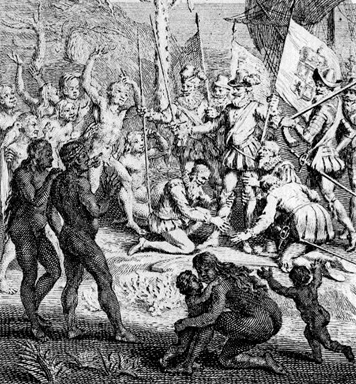 The capture of Caonabo was indeed the happiest and most important event for the colony […. But] weakness did not dishonor him in captivity. He boasted of being the enemy of the Spaniards! He showed no remorse, no regret, not even for the sack of Navidad when reproached. A ship in the port of Isabelle was ready to set sail for Spain; Caonabo was put on it. Beset by a violent storm not far from the coast of Haiti, the boat sank with its royal prisoner.